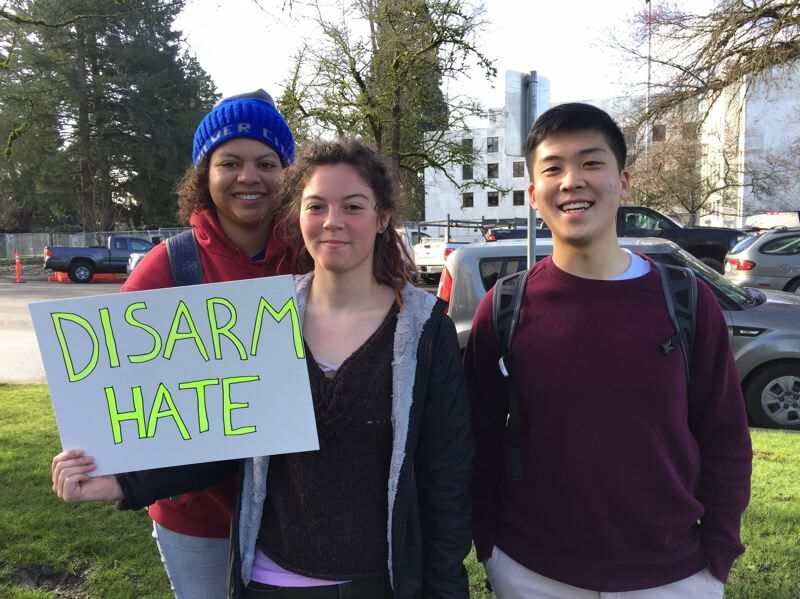 Portland-area students joined a national walkout Wednesday morning to focus attention on gun violence and school shootings. Hundreds of students from dozens of schools — from Portland to Woodburn — left their classes at 10 a.m. March 14, as part of a national movement. Local walkouts were organized by students in each school. Nationally, the #Enough campaign was organized by the Women's March Youth Empower initiative. About 3,200 schools across the nation are expected to participate in the walkout. The walkout comes one month after 17 students were shot to death during a rampage at Marjory Stoneman Douglas High School in Parkland, Florida. The walkouts were supposed to last 17 minutes, to honor students who were killed Feb. 14. As Lincoln High School students commemorated the 17 students and educators killed in the rampage, a small group marched through downtown Portland to make a louder statement. Closely watched by teachers and administrators, hundreds met on the athletic field behind the school just before 10 a.m. March 14. With Mayor Wheeler in attendance, a student from the leadership classes asked them to shut off their phones and they sat for 17 minutes of silence on the turf. Seventeen chairs and desks symbolized the dead. Then, with "Lean on Me" by Bill Withers playing on the sound system, some students who had written letters to the Florida families placed them on the desks. The ceremony ended and students returned to class. School nurse Mary Johnson was surprised by the students' dedication during the event. "I've seen one-minute and three-minute silences before, but never anything this long," Johnson said. Freshman Eliza Andersen said the event was optional. "It was for whoever felt the need to have a moment of silence for what happened. You had an option to stay in the classroom." Her friend, Iako Uchiyama, added, "I didn't know anyone in Florida, but I thought it was important to be heard through our silence." Andersen added that recent events have felt different. "In class we've started watching videos about it. This is the first shooting that people have actually started to learn about. We've been watching news reports and watching other students talking." Freshman Minga Mandekor said the mood was good during the rally. "Everyone was just sitting and being quiet, which was nice. Then there was a sing-along but nobody really sang, which was disappointing. But It's not really civil disobedience if the teachers are organizing it." Students began to express frustration at the confined walkout event. "I think this was not a useful experience," said Gabe Rosenfeld. "It was planned by the teachers which takes the power out of it. This was like a field trip to go sit on the field. Then they covered it up with a cheesy pop song. So I don't think we did anything today." Rosenfeld added that he wanted to do something "student-powered, not like an elective." "The entire walkout felt like footage for the news. There was a helicopter. It felt like relief for Portland that students are doing something. But really I felt like an actor, sitting on the field." About 30 students holding small, hand-made signs gathered on the west terrace determined to take the protest to the streets. They came with statements which they read from their phones, and one student's mother, who had assigned herself a protective role. "We need to show this is an issue that matters to us, teens and children are in danger of school shootings the most," said Jove Hershfeld. "We need to show our legislators that this is important, and we're not going to let guns be a rampant issue." The group planned to join Northwest Academy students for their walkout, but received texts saying it was only 10 minutes long and was already over. After circling the building a few times, they marched downtown through the South Park Blocks to City Hall. There a security guard told then that Wheeler was in a City Council meeting and asked them to be quiet. The students then set off for St. Mary's Academy on Southwest Broadway. They chanted outside and St. Mary's students waved from an upper classroom window. A teacher made it clear St. Mary's students were not joining the march. "We're trying to rally people," said Hershfeld. "There's definitely nothing more angering than what just happened at Lincoln. We all just sat for 17 minutes in silence, acting as if this event was a one-time event. "Staying silent is not enough, because it's going to take lots and lots of action to pass stricter gun legislation. The loss of life at Parkland is not an isolated event. Acknowledging it is important but not just continue being like, 'Oh we're sad this happened but we're just going to leave it at that." Students chanted "Hey hey, ho ho, the NRA has got to go" and other anti-gun violence statements as they walked across the Portland State University campus to appreciative honks from drivers. The students returned to City Hall, where Wheeler talked with them in City Hall's atrium. Portland Mayor Ted Wheeler wrote in a letter to Portland students that he supported the walkout and would continue pushing for "common sense gun laws." "We need our federal leaders and state leaders across the country to step up to protect our citizens from these entirely preventable tragedies," Wheeler wrote. "In the wake of the mass shooting that left 17 people dead in Parkland — another shooting where an AR-15 was used — thoughts and prayers alone are not enough." Wheeler is part of Mayors Against Illegal Guns, a national coalition fighting for gun violence prevention. More than 1,000 current and former mayors in the group have called for Congress to act on the issue of gun violence. Oregon Senate President Peter Courtney said Wednesday morning that he also supported the walkouts. "Our schools should be safe havens that foster learning and understanding," said Courtney, a North Salem Democrat. "Students should be able to focus on their studies. Educators should be able to focus on instruction. Parents should have the peace of mind that comes with knowing their children are safe." State Rep. Karin Power, a freshman Democrat running unopposed to keep her seat representing Milwaukie, Oak Grove and parts of Southeast Portland, wrote directly to students who participated. "I strongly support students' work to increase school safety and am proud of any and all students in my district who exercise their First Amendment rights today," Power wrote on her Facebook page. "You may not be able to vote yet, but you have the power to change our country." North Clackamas School District Superintendent Matt Utterback said that the "tragedy provides a teachable moment for our students and community" with the nation's attention focused on issues of school violence, student safety and civic engagement. "While this demonstration is not a district sponsored event, we recognize the rights of students," Utterback wrote in a letter to parents. "The Supreme Court has affirmed students have a right to freedom of expression, and a peaceful walkout conforms to this right. 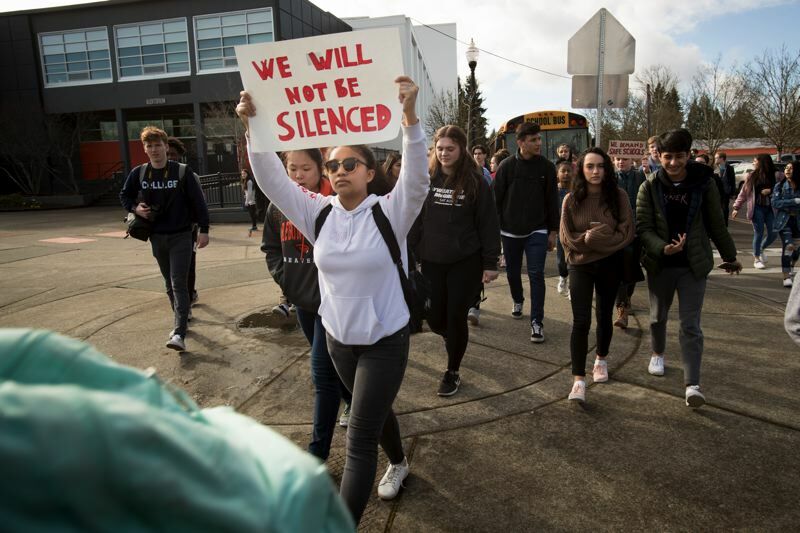 Additionally, North Clackamas School District board policy allows for peaceful student demonstrations on district property under certain conditions." Local school principals could neither support nor condemn the protests, but they offered their own interpretations. Gladstone's Kraxberger Middle School Principal Len Reed said that the walkouts were "spurred by the national discussion regarding school safety and the right of students to learn in a safe environment." She worked with student leaders "to encourage them to plan safe and orderly walkouts" on campus and in a safe location. Supervision during the event was provided by administrators and Gladstone Police school resource officer Lee Gilliam. At Gladstone High School, Principal Kevin Taylor said that the students in "solidarity for school safety" planned a short statement of purpose, a reading of the 17 names, the signing of a banner to send to Stoneman Douglas students and a moment of silence. Oregon City Superintendent Larry Didway planned different strategies for different student age groups. Principals worked with student leaders in middle and high schools to ensure that coordinated walkouts were safe and orderly. At elementary schools in Oregon City, Didway wanted "to support student voice by encouraging strategies that promote the importance of having safe and welcoming schools for all students." Oregon City elementary school staff did "not focus on the recent violent events across the country, but rather on how we must treat each other with kindness and take care of each other." Didway concluded, "As educators, we feel a responsibility to support student voice and ensure safety." Portland Public Schools worked with police and fire officials to aid the student walkouts. 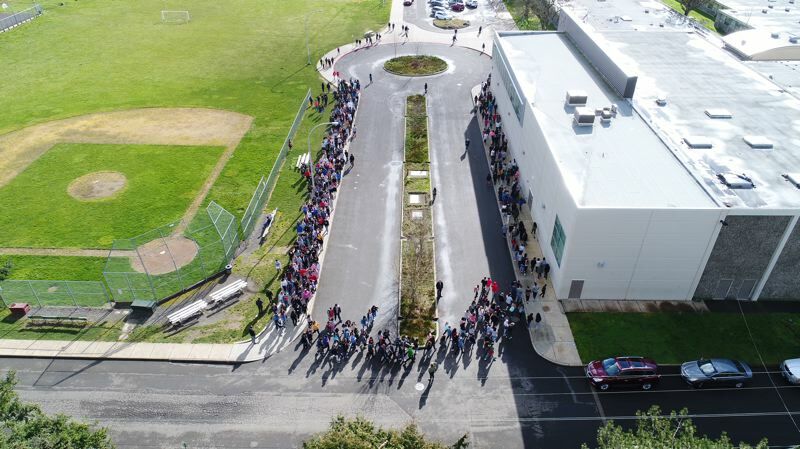 At Roosevelt High School, PPS Superintendent Guadalupe Guerrero, school board members and some Portland-area officials were on hand as students walked onto the school's athletic field, held a moment of silence and then heard from three students and a teacher. At Stephenson Elementary School in Southwest Portland, students planned to line up in a rainbow and sing "The Rainbow Connection" during their walkout. Students from Portland-area colleges also planned walkout events. 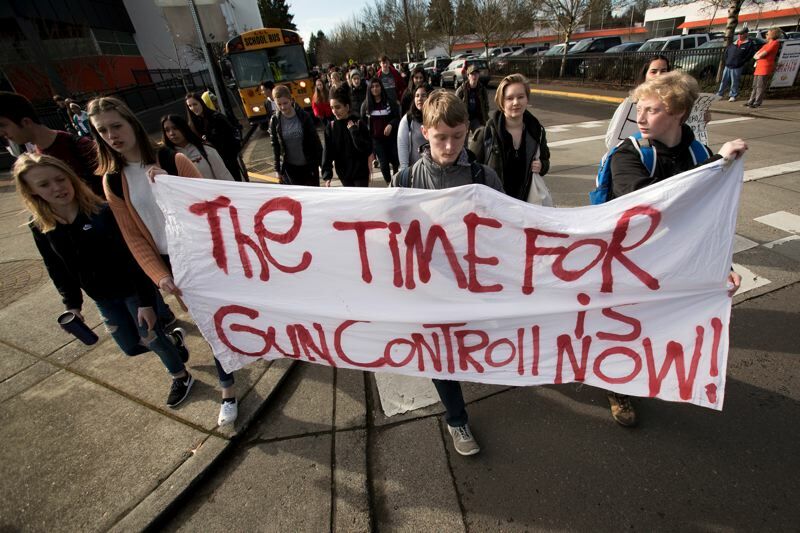 At Tualatin High School, a student-organized walkout included student speakers who talked about the importance of solving the gun violence issue. 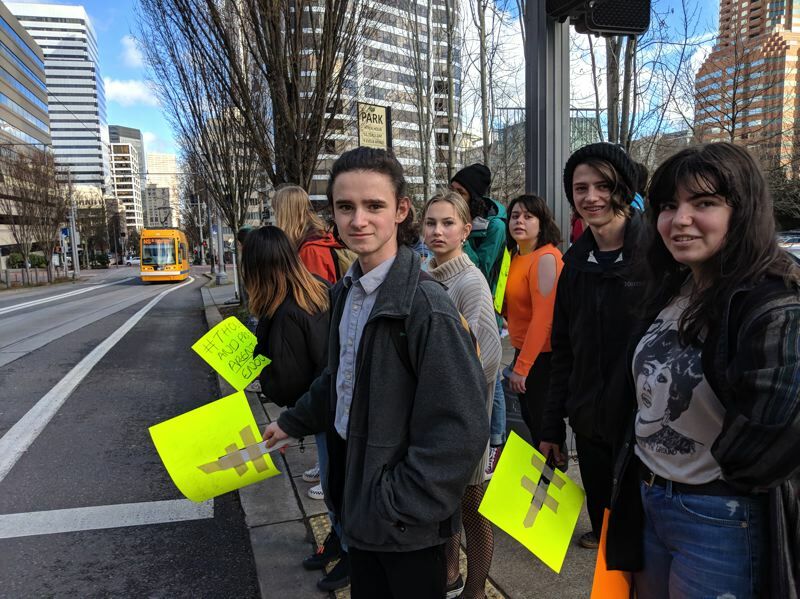 "As students, we cannot sit on the sidelines hoping that lawmakers take action on gun reforms and preventing gun violence in our schools," said Bailey Langley, a Tualatin High School student who helped organize the walkout. "We are demanding to be heard." Hadley Carlberg, a TUHS senior who helped organize the walkout, was in Salem for the March 5 ceremony in which Gov. Kate Brown signed a bill prohibiting people with domestic violence issues from possessing guns. Reporters Joseph Gallivan and Raymond Rendleman contributed to this story. 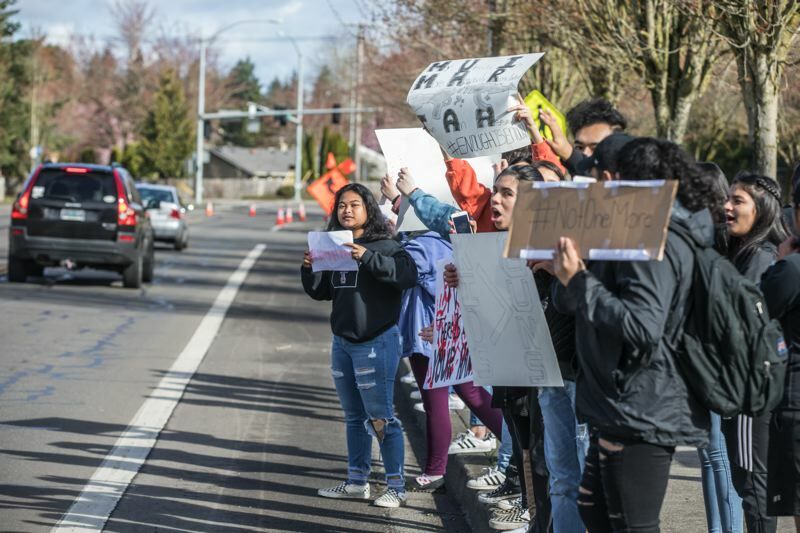 EDITOR'S NOTE: A caption incorrectly identified Tualatin students who organized a rally outside Tualatin High School.